Foot stool for the Karuselli chair, designed by Yrjö Kukkapuro. Designed by Yrjö Kukkapuro, Karuselli is one of the most famous lounge chairs in the world. Kukkapuro began developing the fibreglass chair in the 1950s, arriving at the famous shape in 1964. The international launch of the chair took place at the Cologne Furniture Fair in 1965. The shape of the Karuselli chair is the result of extensive experimentation. Kukkapuro spent four years sculpting it – searching for the right dimensions, initially using his own body as a guide. Karuselli is exceptionally comfortable as well as stylistically distinctive precisely because it is ergonomically based on the shape and proportions of the human body. As a result of his persistent efforts, Kukkapuro finally accomplished a form that represented a novel combination of ergonomics, new materials and production methods, as well as artistic design. 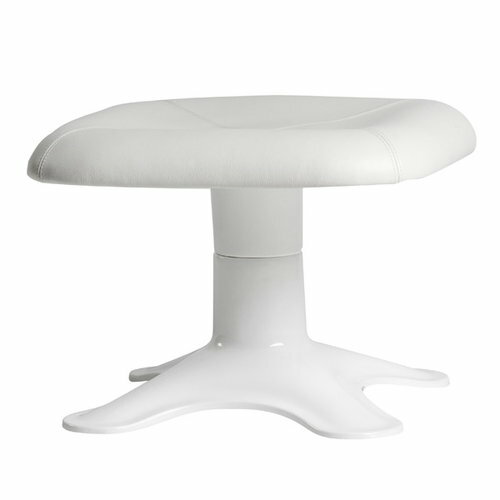 It was the combination of these qualities that made Karuselli a revolutionary chair of its time. Ever since its first launch, Karuselli has caught the eye, captured the imagination and has given pleasure to those sitting in it.